A worker at RFTA's maintenance facility in Glenwood Springs walks between buses. The agency is asking voters to approve a property tax increase this November to fund its plans to grow. "Watch how tight this is," he says. "Sometimes there may be a driver that's inspecting their bus here. And another driver might be backing up and he'll get hit with a ski rack or get his foot run over." Matt Bloom reports on RFTA’s need to upgrade its aging system. Voters in the area will decide on a critical funding question for mass transit. Built in 2002, the facility was designed to hold about 30 buses. Right now around 45 are packed together like tetris pieces. And that's just one part of the problem. Growing ridership and increasing traffic congestion have bogged down the RFTA system for years. In 2017, it logged about 5 million passenger trips through the Roaring Fork Valley, making it the second-largest public transit system in the state after Denver's Regional Transportation District. "The reality of this deal is that we have allowed so much growth to occur here that we have to say yes to transit." The valley's population, employment growth and housing development are all on the rise. Meanwhile, RFTA's average bus is nine years old with an average 402,000 miles on it. Buses should be replaced every 12 years or at 500,000 miles, according to Blankenship, but right now there's not enough money in the budget for that. "Based on the 60 percent population growth over the next 20 or so years in the Garfield County area, we will not have the ability to add more buses and add more service unless we can expand," he said. Holding back RFTA's growth is an antiquated funding model. It's a problem weighing on the minds of transportation leaders across Colorado. It's budget is limited to revenue collected from a regional sales tax. But that could change come November. A local ballot measure, 7A, will ask voters in Garfield, Pitkin and Eagle counties to approve a new 2.65 mill levy on properties within RFTA's jurisdiction. The additional revenue would go straight to transportation projects. The new tax would cost private homeowners about $7 per month on a $500,000 home, according to RFTA estimates. Commercial property owners would have to pay around $64 per month under the new plan. The agency's board already has a massive list of projects it would fund in the coming decades using the new revenue. The plan has been billed under the forward-looking name "Destination 2040." It promises increased bus service during peak seasons, new buses and upgrades to maintenance facilities, among other projects. 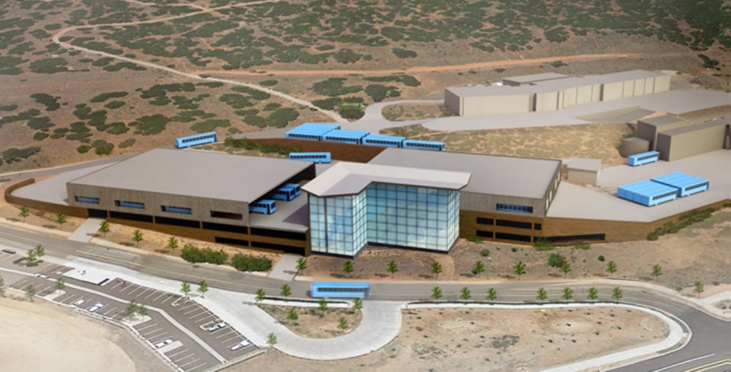 A rendering of the proposed improvements to RFTA's Glenwood Springs maintenance facility. The $30 million project is just one piece of the agency's massive plan to upgrade services, pending approval of a local property tax increase question this November. Jacque Whitsitt, mayor of Basalt and RFTA board member, said the benefits of the plan far outweigh the cost. "The reality of this deal is that we have allowed so much growth to occur here that we have to say yes to transit," she said. "We have to say yes to all those things we've put on ourselves because we keep allowing more and more growth." Reaction from the community has been mixed. "(...) We will not have the ability to add more buses and add more service unless we can expand." Carbondale resident Larry Ballenger voiced his concern at an August public meeting on the ballot question. It was one of many meetings held in the months leading up to the vote. "My family does not utilize RFTA's facilities," he said. "We don't hike or bike the Rio Grande Trail. We're retired and on a fixed income. We're opposed to any type of tax increase." Chrissy Strom, a real estate broker in Carbondale, said she supports the measure because her 77-year-old father relies on the bus to get around. "I think that's it's important that you might not use the bus. There are people who rely on it for an economic or personal value that really sustains the level of community that's unmatchable to any other community," she said. Supporters of 7A say there could be dire consequences for the system if the ballot question is not passed, including the loss of existing bus routes. It's a risk voters will have to take into account when wading through an already packed ballot with two additional statewide questions for transportation funding. More people than ever are using the state’s roads, buses and rail lines to get around. As we learned from your Curious Colorado questions, you have a lot of questions about how the state’s transportation systems will keep up with the ever-growing population.